THERE are jazz piano trios… and there are jazz piano trios. Over the years, the familiar piano/bass/drums line-up has come and gone, mostly offering standard fare with pleasant, yet unchallenging similarity. In recent times, however, the trio format has undergone something of a renaissance, with perhaps the Esbjörn Svensson Trio (e.s.t.) leading the way in shaking up the establishment and shining a bright, new light on the 21st Century jazz scene… until so tragically extinguished. Then comes ‘Walking Dark’, a brand new studio album of, again, entirely original works – and an absolute triumph! – released by Edition Records, a UK label renowned for successfully nurturing and promoting exceptional new jazz talent. From the off, this creative soundworld delivers a highly exciting and engaging experience – Høiby’s agile, driving and melodious double bass sounding like no other; Neame’s seemingly effortless yet energetic piano work (a chromatic ripple here, a deftly high-flying solo line there, and characteristically complex chord progressions I can only dream of emulating! ); and Eger coaxing the most gigantic and thrilling percussion via his unique and ebullient approach to drumming (‘amazing to witness Anton eloquently teasing extraordinary sounds out of his kit, with trademark enthusiastic vigour, using kitchen utensils!). 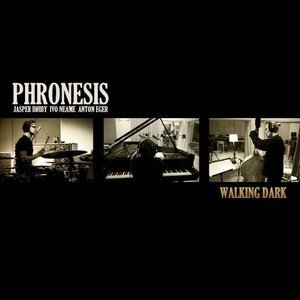 Phronesis create such a remarkably integrated sound (no ‘your turn next’ soloing here) which benefits from the sharing of the compositional role. The twelve numbers on this album, totalling well over an hour, are clearly all from the same stable, yet the variety in writing provides a captivating journey of differing timbres, techniques and moods – and a breathtaking array of talent and craftsmanship from just three instrumentalists, recorded over a mere three days! Highlighting tracks is difficult, and perhaps futile, with an album of this warmth and stature. However, Eger’s ‘Zieding’ and ‘The Economist’ provide the only evidence you need to grab a copy of this album for yourself. Neame’s brilliantly edgy and excitable ‘American Jesus’ contrasts with his floaty, spacial ‘Passing Clouds’, whilst Høiby (taking the majority of writing credits) gives us the wonderfully pulsating opening title track and the charming ‘Suede Trees’. If you’re excited by groundbreaking contemporary jazz, I challenge you not to be impressed by the ride!